Tree swallows crisscross the pond on zip-lines of air, their blue backs catching the sunlight. Now and then one pauses on a fence post and gives me a chance to study it for couple of seconds before returning to its play. The pond seems more alive now that the tree swallows are back. Tiny infrared video camera for inside a birdouse! Uses invisible light from infrared diodes. Plug cord into TV or computer screen and watch eggs hatch and parents tend their young. 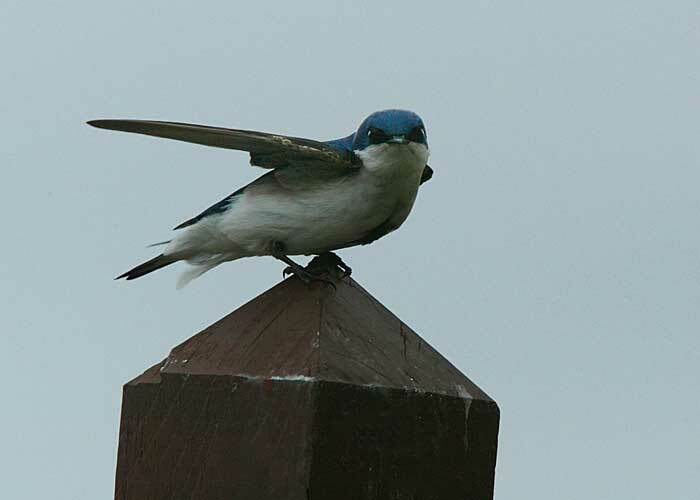 Tree swallows often nest in birdhouses. Wouldn't it be fun to watch the babies in the nest? Here's a demo video of what one Hawk-Eye Nature Cam saw.